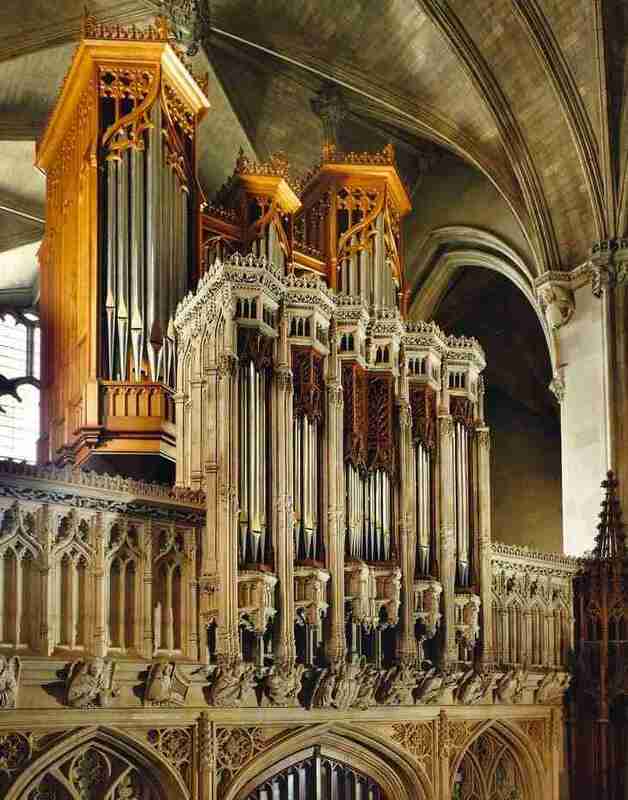 The design of a new organ for the chapel of Magdalen College, Oxford, posed several interesting problems - not least, because the musical traditions of the College demanded an organ that could do justice to the accompaniment of a wide-ranging choral repertoire, in addition to the other needs of a teaching establishment. However, the chapel is not large and the old organ effectively filled the arch between chapel and ante-chapel, destroying the sense of connection between the two, and masking the light from the magnificent clear west window, which was subsequently replaced with an impressive monochrome decorated window to match the other windows of the Ante-Chapel. 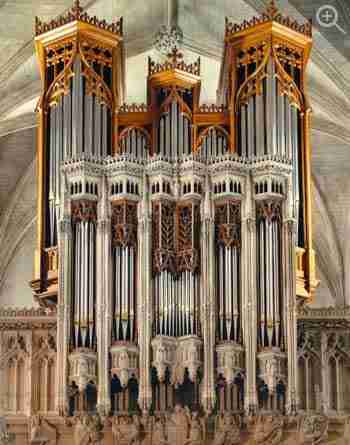 The need to reestablish the architectural unity of the building dictated that the new organ should be of more modest proportions, both physically and in number of stops. Further, the remarkable stone Chaire case, designed by Cottingham in about 1830, was to form part of the new scheme. 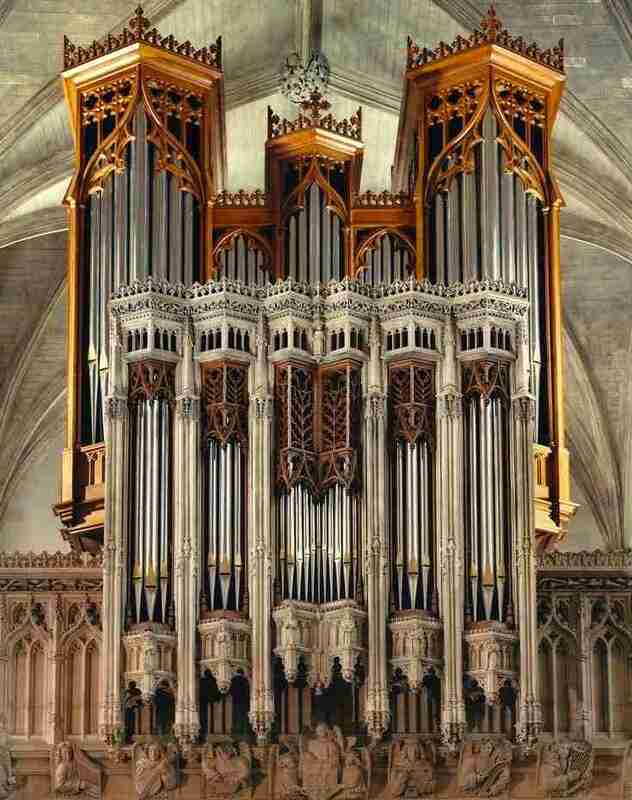 Its awkward size - too large for a Choir organ, but barely big enough for a major department - was a further complicating factor both in the design of the new organ, and in establishing the proportions of the new main case. These problems were overcome, and the result is an intriguing and versatile new instrument. 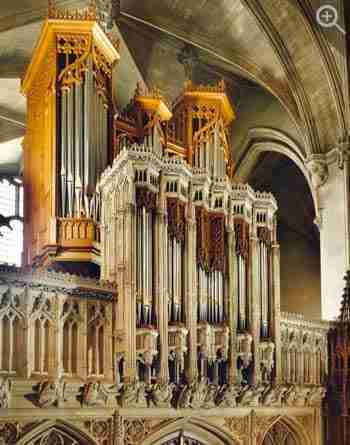 The Great Organ is housed behind the player's back in the stone Chaire case, and the Swell and Pedal Organs are housed in a new oak main case, designed by the architect Julian Bicknell. The key and pedal actions are mechanical, with wooden trackers, rollers and squares, and there is a third coupler manual. The mechanical drawstop action incorporates four 'general' composition pedals, instantly adjustable at the console. The traditional winding system incorporates hand blowing as well as the more usual electric fan, and the entire organ is fed from one very large double-rise reservoir. The tremulants are of Dom Bedos design.